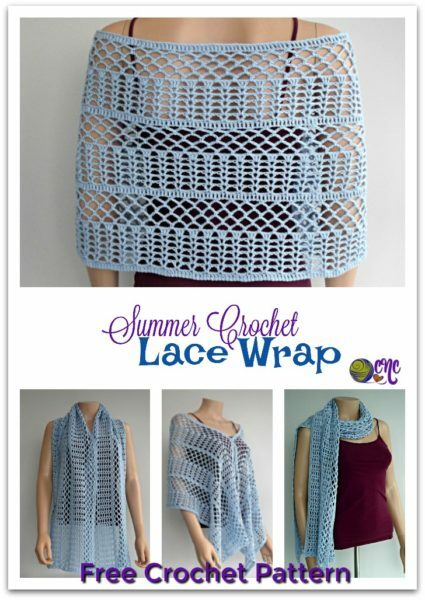 The summer crochet lace wrap pattern can be finished off in two ways for two slightly different looks to meet your individual style. As for the number of ways that you can wear it, is up to your imagination. 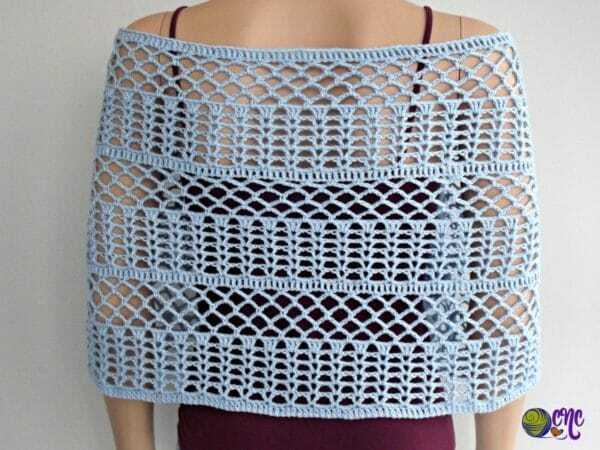 However, I’ve shown you several possibilities for this styling crochet wrap in the following images. To wear this beauty as shown below you will need a shawl pin. This is really cool because it allows the wrap to drape down at the front. It’s a great way to hide any unwanted bulge. In the image below you can see it worn long like an elegant scarf. This is one of my favorite ways to show off the pretty lace. It looks super cool over a tank, but you could wear it like that with just about anything from a summer dress to a winter sweater. This would also look very sharp in white for a wedding. Another option is to wrap it around the neck for a cozy scarf in the winter. This is nice because you can tuck the ends away under your jacket without it bulking up while keeping your neck nice and cozy. As you can see, the lace at the top of the wrap is different than at the bottom of the wrap. If you want both sides to look somewhat the same you simple change where you end the pattern repeat. See the pattern variation at the bottom of the pattern. This wrap pattern is very easy to adjust in length and width, thus making it easy for you to substitute with almost any kind of yarn that you have on hand. However, I love the yarn used here because it’s soft and gives the wrap a nice drape. Therefore, I would recommend using something similar. And it’s 52% cotton, which along with the open lace stitch, makes it great for the hot summer weather. I simply love this stitch pattern because not only is it pretty, but it’s also quick to crochet up; and it makes the yarn go a long way. 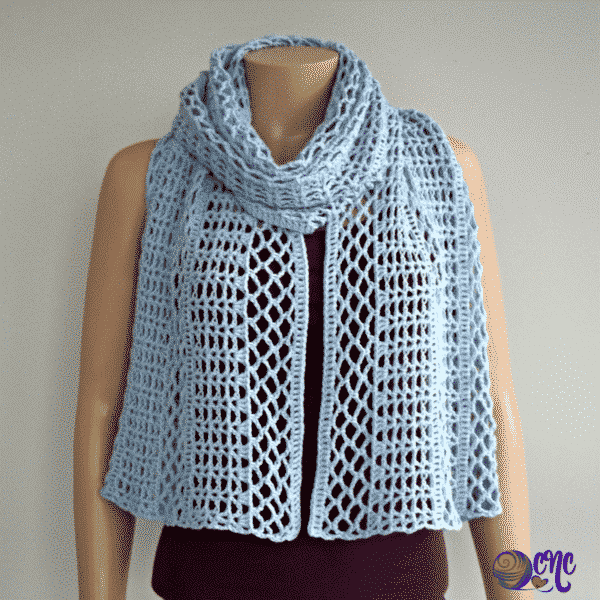 Two other patterns using the same stitch pattern are this top and this scarf. Finished Size: 64″ long by 18″ wide after blocking. However the width shrinks back to about 15″. Gauge (before blocking): 23 sts = 5″. Ch 288, or any multiple of 4. Row 1 (RS): Dc in 5th ch from hook an into each ch across. (Skipped chs count as first dc.) [285 sts] Turn. Row 2 (WS): Ch 3 (counts as first dc, now and throughout), sk next st, (v-st, ch 1) in next st, *sk next 3 sts, (v-st, ch 1) in next st; rep from * across to last 2 sts omitting last ch-1, sk next st, dc in last st. [71 v-sts] Turn. Row 7: Ch 3, (3 dc, ch 1) in first v-st and into each v-st across omitting the last ch-1; dc in last st. [215 dc] Turn. Row 8: Ch 1, (sc, ch 5) in first st, (sc, ch-5) into next ch-1 sp and into each ch-1 sp across; sc in last st. [71 ch-5 sps] Turn. Row 9: Ch 5 (counts as first dc and ch-2 sp, now and throughout), (sc, ch 5) into first ch-5 sp and into each ch-5 sp across omitting the last ch-5; ch 2, dc in last st. [70 ch-5 sps and 2 ch-2 sps] Turn. Row 10: Ch 1, (sc, ch 5) in first st, (sc, ch-5) into next ch-5 sp and into each ch-5 sp across; sc in last st. [71 ch-5 sps] Turn. Row 12: Ch 1, (sc, ch 3) in first st, (sc, ch 3) into next ch-5 sp and into each ch-5 sp across; sc in last st. [71 ch-3 sps] Turn. Row 13: Ch 3, dc into first ch and into each ch and st across. [285 dc] Turn. Rows 14-37: Rep rows 2-13 twice. Fasten Off at last row. To have both sides somewhat the same you can end your repeats after a repeat of Row 6. Then for the last row: Ch 3, dc in next st and into each st and ch across. Fasten Off. What’s your favorite way to wear this elegant wrap? And did you use the recommended yarn, or did you substitute? Let us know in the comments below. Last, but not least, don’t forget to check out more wrap patterns here on CNC. 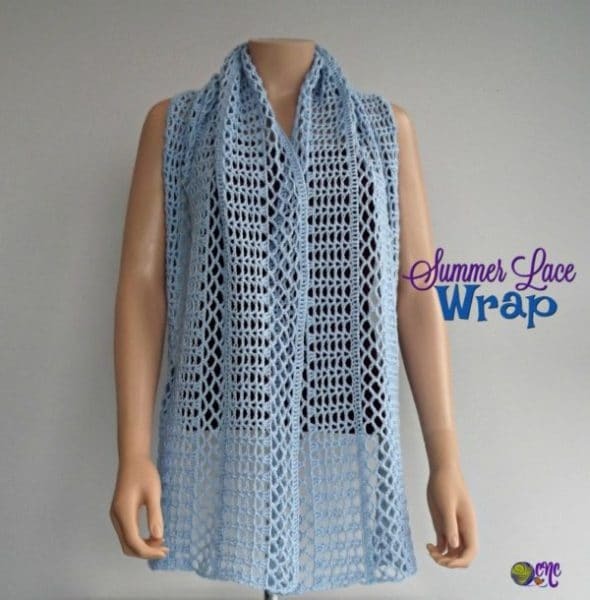 This is a beautiful summertime wrap!!! Now if I could just win the yarn LOL… actually I am planning on making this whether or not I win because it is perfect for summer!!! very pretty! thank you for this pattern! Beautiful! Hope to try it soon, thank you! I just love this wrap and thank you for showing the many ways it can be worn. 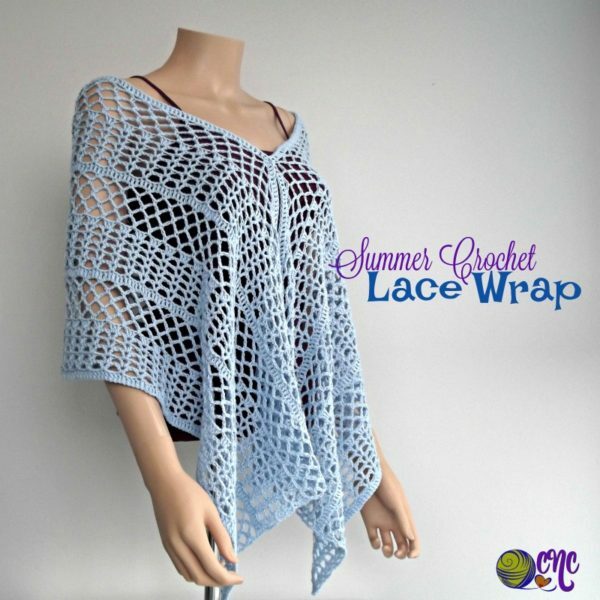 Summer Crochet Lace Wrap is very nice!! fasten wrap in the front. Beautiful! I will definitely use this pattern again! Thank you!